Hong Kong should be on everyone's travel destination as this modern, yet traditional city can offer travelers much more than a picturesque skyline. This ever-changing city seems to never sleep with tons of things to do and see from sunrise to well beyond sunset. I'll be giving a brief overview from When To Visit Hong Kong, Where to Stay, Transportation, Food & Drink, Things to See and Do, & Photography Spots in Hong Kong. Fall or early winter is the best times to visit as Hong Kong becomes cool and breezy during these months. During summer and spring season, Hong Kong becomes way too hot and humid. However, many tourist still visit Hong Kong for summer and spring. When visiting during fall, winter, and even summer buy an umbrella when you get there for unexpected rain storms. If you decide to visit Hong Kong during the summer or spring months, bring a light jacket as indoors places like restaurants or shops blast the A/C and can get uncomfortably cold. Hong Kong is comprised of three different islands: Hong Kong Island, Kowloon, and the New Territories. Each island offers its own uniqueness and are close to various sightseeing attractions. Most tourist try to stay near central on Hong Kong Island or near Mongkok in Kowloon. Keep in mind that most rooms in Hong Kong are small no matter where you stay. Below you can find hotels that I've stayed at and recommend (not in any particular order). If you don't mind being on the south harbour, this hotel has excellent customer service and a ton of awesome perks like free breakfast & free alcohol bar (located west of Ocean Park on map). Fantastic location, fair price & provides a fully functional phone with Wi-Fi hotspot (located north in Mong Kok). The definition of luxury. Incredible service, luxurious rooms, great location & also provides a fully functional phone with Wi-Fi hotspot (located at the drop pin). Transportation in Hong Kong is nothing to be afraid of. Their subway system, known as the MTR, is one of the best. It can get packed during rush hour, but overall the MTR is very clean, prompt, and safe. Getting from Hong Kong’s Airport to the city is a breeze. Use the Hong Kong Airport Express as it is the fastest, cheapest, and easiest option. If you plan on taking the MTR, it is best to get Hong Kong's versatile stored-value Octopus Card as it can be used on purchases other than the MTR like at 7-11 and McDonalds. These are other modes of transportation in Hong Kong. You'll only be taking these if the MTR can't take you to your destination. I've put together a simple, easy transportation guide here. Hong Kong is truly an east meets west city where you have authentic Chinese food, but also the comforts of western food. Below is a list to get you started. Since Yelp isn't really a thing in HK, use OpenRice to search for restaurant reviews. Tim Ho Wan - Cheapest Michelin star restaurant in the world with the best BBQ pork buns. Din Tai Fung - Great dim sum place with delicious dumplings, siu lung bao, and pretty much everything else. There's also a window where you can watch the cooks prepare and cook everything. Mandarin Grill + Bar at Mandarin Oriental - Food presentation is on point with wonderful food and fantastic service. Joy Hing - If you're looking for some roasted meat, head to Wanchai for some authentic Chinese cuisine. Stone's - If you're missing the pub vibes, you can find it here with an excellent selection of craft beers and great burgers. Beef & Liberty Wanchai Burgers - Real good burgers. Period. Sing Heung Yuen - If you're looking for a truly unique food experience, come here and enjoy the tomato soup noodle. 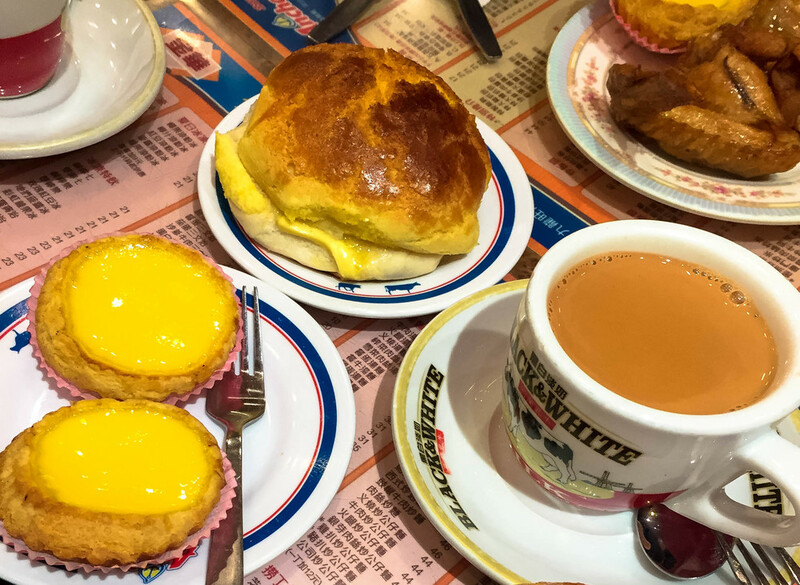 Tsui Wah Restaurant - Service is not the best here, but the HKG Milk Tea, egg tart, and the pineapple bun (with a stick of butter) are the things to get. Jumbo Floating Restaurant - More of an novelty eating experience, this restaurant is on a boat out in the water. Ozone Bar - Located at the top of the Ritz Carlton, this up-scale bar is the highest bar in the world with an incredible view to prove it. Lobby Lounge (InterContinental Hong Kong) - Great place for some drinks with a can't beat view of the harbour. Little L.A.B - Located in SoHo, here's a place where you can create your own cocktail with their secret ingredients. Hong Kong Brew House - Another great western place to meet up with friends and have a few brews with some free nuts. If you'd like to bar hop, the SoHo district is the place to go. This area is usually filled with locals and foreigners and things can get a bit crazy. Big Bus Tour - An easy way to explore Hong Kong. You don't have to deal with transportation and it takes you to all the popular sites! Monastery Nan Lian Garden - A serene and quiet find in the hustle and bustle of Hong Kong. The Big Buddha/Po Lin - Once the world's largest outdoor Buddha statue. Yick Cheong - Great photography spot to capture HK's architecture (also where Transformers was filmed). Man Mo Temple - A beautiful temple filled with hanging incense cones. Victoria Peak - The best view of Hong Kong's Skyline. Avenue of Stars - A place to honor Hong Kong's movie stars (closed until 2018). Tai O - A very lively fishing village with delicious seafood to eat & pink dolphins to see. Stanley Market || Ladies Market - Brush up on your bargaining skills here where you can find (fake) brand names, knick knacks, electronic accessories and much more. Hong Kong Disneyland - Very similar to Disneyland with a few unique rides. It is cheaper and smaller than the original park, but HK Disney still brings the Disney magic regardless. Victoria Harbour - Between Hong Kong Island and Kowloon, this harbour illuminates nightly with "A Symphony of Lights" show. 10000 Buddhas - Walk past 10000 buddha statues all in various poses. Hong Kong is a playground for any type of photographers. Whether you're into street, architect, cityscape, and even landscape photography, Hong Kong has got you covered. One of Hong Kong's biggest photography strength is it's architecture as most buildings are just made for symmetrical photography. It's Hong Kong's iconic cityscape shot. Ideal time would be at night. Another great cityscape shot with the harbour in the foreground. There's a "Sympathy of Lights" every night at 8:00 PM that can be fun to incorporate in your shot. It's a beautiful garden that is photogenic everywhere you look. There's a waterfall and it's set in the middle of the modern city of Hong Kong (see picture at top of page). A skyscraper view overlooking all of Hong Kong. Color apartment buildings (pictured right). For more photography spots in Hong Kong, check out Eden Wu's 5 Best Hong Kong Photography Spots. Are you visiting Hong Kong soon? What are you most excited about? Let me know in the comment below!